So, Did You Take Care of Business? Our research says that it would be wise to complete this conversion process by August 2012. What conversion process? That of converting your paper savings primarily into minted gold and silver bullion coins. When we posted that idea on June 6, the price of gold was $1,621 per ounce. From June 6 through August 20, it meandered between $1,553 and $1,629 per ounce. Then it took off to the upside and now sits at $1,774 as I write. (At the time of posting, the price is $1,766.) If you completed the process by August 20, the dollar value of your metals holdings has increased by 9% to 14% in one to three months. If you did the entire conversion late on the last day of August, the dollar value has increased by “only” 5% in a few of weeks. who still needed to do this conversion as of June 6. If you have still not taken care of business in this way, we would really like to hear why. You can easily piece together our e-mail address on the Contact page. Send your reasons. What have we failed to explain with sufficient clarity? Worthless derivatives are being created by Wall St and High St at the rate of a million dollars per second! Governments have promised citizens far more than can ever be funded. If the big banks told the truth about their financial condition, all of them would be seen as insolvent. And it has been obvious for years that most countries in the world had taken on more debt than they could ever repay, and that their only strategy would be to print money. They are doing so. With extreme prejudice! We are fairly certain that you heard that the US Federal Reserve has promised to print $40 billion per month. Ad infinitum! The week before, the European Central Bank promised to print billions as needed. The Bank of Japan joined them last week in the printing campaign. Each of the things in this paragraph would be enough to dissolve the financial system. Taken together, they are an absolute guarantee. Your paper savings and your income are being devalued by this massive ceaseless money printing. It is an act of desperation by the central bank minions of the bankster class. Their aim is to preserve the game of the big bankers, to enable those bankers to continue their game of theft from all of us. They do not have your interests in mind. Why continue to let these thieves steal from you? Chris Martenson of PeakProsperity.com often and elegantly describes how, once people wake up to the true nature of our current societal systems, they change their life in a big way. They can’t help it. And they do not regret the changes they make. They may lose income by leaving jobs they dislike, but they pare expenses more quickly. They might need to physically move to a new area. But they begin to enjoy life more, to find the pursuit of their new aims quite nourishing on many levels. In these times, we contend that it is not enough to wake up only on the inside or only on the outside. We need to do both. And to live from our insights in both realms. OK, you may have missed the opportunity to buy cheaper gold and silver through August 20. But the prices of these metals, calculated as they are in paper currencies whose quantities are being increased by the minute, will be much, much higher, and sooner than most think. If you think this bears some resemblance to the first chart above, the chart of US stocks priced in gold, then you are getting the picture. 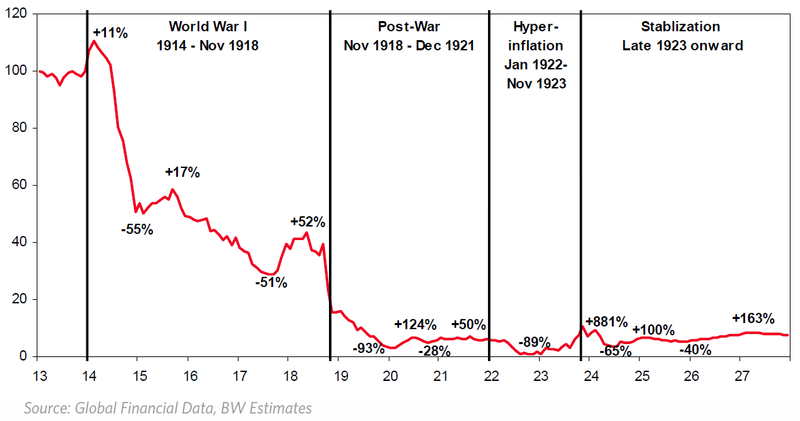 At the end of a hyperinflation, stocks crash mercilessly in real value as the currency loses all value. In other words, those who stay in stocks stand to lose almost all of their purchasing power! They might appear to have a lot of dollars. But those dollars will be very near worthless. 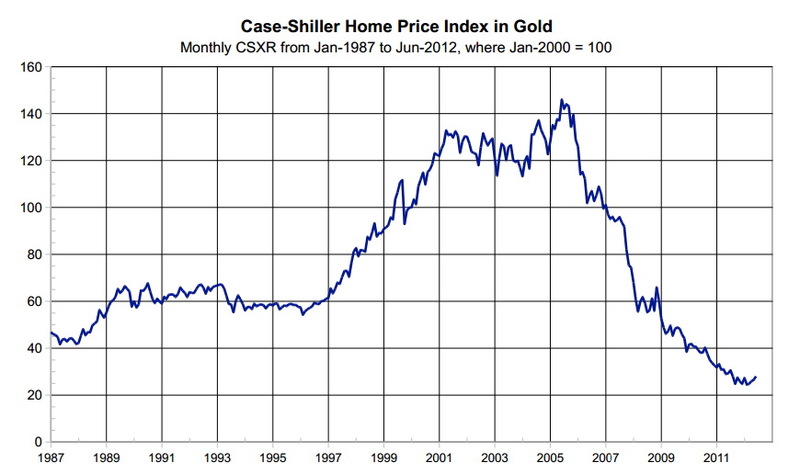 If you understand this chart, you can see that US real estate is worth about half what it was worth in 1987—when priced in real money, that is, gold. At the end of the Weimar episode, it is said that you could buy an entire city block of real estate in Berlin for one ounce of gold. We are rapidly moving along that path. Since the real estate price peak, gold has outperformed real estate by about 6 to 1. And the real estate price collapse is happening while the authorities are madly printing money! If real estate were the inflation hedge that its proponents claim, real estate prices should be soaring. Alas, at least no one is claiming that such prices are soaring. But the proponents misunderstand this real estate “asset class.” Its prices are floating on a sea of debt. Once governments can no longer support that debt, prices will drop like a stone. And residential real estate was never supposed to be an “asset class.” It was supposed to be lived in! 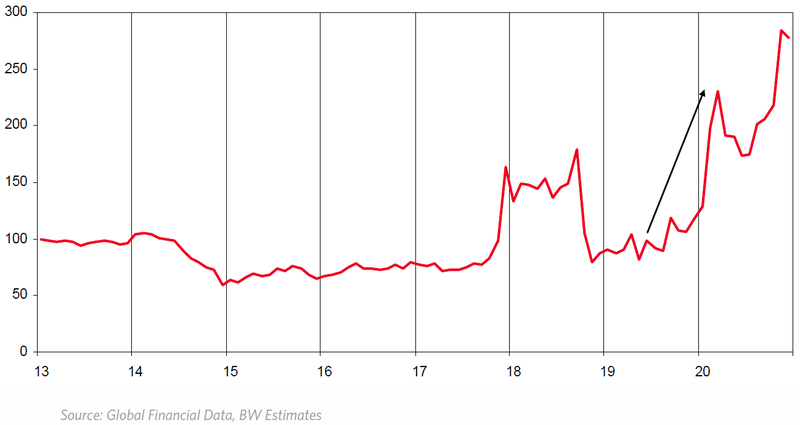 Were the charts above prepared by some wild-eyed blogger? No, the first is from Bloomberg, the second and third were prepared by the premier hedge fund in the world, manager of well over $100 billion of client money, Bridgewater Associates. All three charts were cited here on ZeroHedge, which, in our view, is wonderfully wild-eyed. The fourth chart is from PricedInGold.com. Our June 6 advice about completing metals purchases by August was tactical in nature: we spent years in the land of the trading thieves and one earns a knack for detecting those time-price areas where people can get lower prices. We wanted any reader who had not yet completed their buying campaign to get the benefit of lower prices. But soon we face something that is likely to be quite different. By the second half of October, events with systemic-level impacts are likely to arise, leading to significantly greater difficulty and/or expense in the acquisition of physical metals. If we had not completed our own buying campaign quite awhile ago, we would be completing it by mid-October. Electronic accounts (bank accounts, brokerage accounts, mutual funds, etc.) are found to be empty after the implosion of the derivatives market, so there are no transactions via ATM’s, credit cards, checks, on-line payment systems, etc. During a transitional period, people and businesses still accept national paper currencies—in hard cash form only, all electronic transactions will not be trusted—while barter, local barter currencies, and minted gold and silver coins become understood and accepted for transactions. During that transitional period, fewer and fewer accept national paper currencies as they increasingly favor local barter currencies, gold coins, and silver coins. Here is the most important issue: Will you be helping others during this transition? Will you be operating from a prepared, strong position? Will you be helping to re-start your local economy by spending some silver and gold? Or will you be paralyzed, floundering, panicking, regretting, in need of help, etc. The choice is straightforward. This entry was posted in Financial System and tagged gold, real estate, stock market by Thundering Heard. Bookmark the permalink. Thank you for this site. So many of us are looking for this practical advice and trustworthy information. The simple truth of discarding systems/concepts that do not benefit humanity, and employing those that do, is very powerful, and resonates like a bell among those who desire to help their fellows. I will refer many to this site. It is a wonderful thing to consider: that when we all do well, we ALL do well! I wonder if you have any links to reputable gold coin sellers that have the lowest mark-up above spot-price?